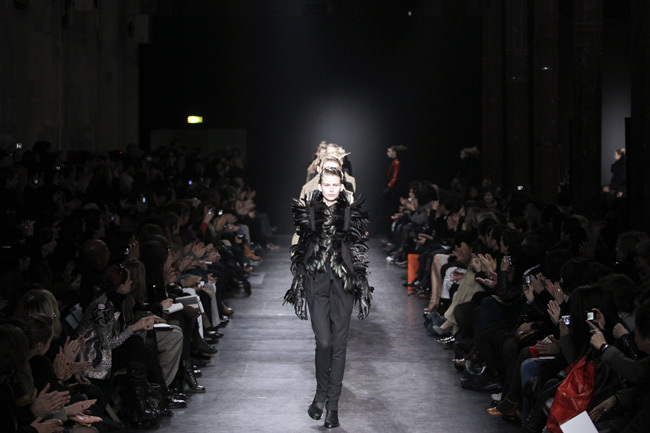 Wauw, that was a beautiful and very feminine collection Ann Demeulemeester showed today. The Belgian designer – famous for her strong and tough ladies – brought out an almost sensual, ladylike collection with wide legged, supple trousers, short jackets with small belts tied around the waist for a tailored silhouette, classic capes and blood red accents. Maybe it was in the contrasting colors and fabrics, the wufty feathers, the gloves, the softer fabrics and focus at the waist – it all made the tough Demeulemeester woman look a bit more vulnerable, and that’s a compliment. Of course there were her signature boots, leather jackets and harnesses of braided cords and dark sentiments, but the romantic mood dominated the collection.